Does not the moon get lonely? They make the black go white! Inspired by today’s daily prompt – Lost. I have a fondness for that which is an example of what it represents. This poem, like the moon, is bright, lovely, and playful. 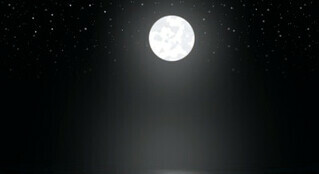 The man watching the moon, like the moon, is lonely, yet, through shared loneliness, not alone. The rhymes feel effortless. The lines that don’t rhyme have an easy rhythm that makes them feel like they do. I’m not a poet. I’m not even particularly fond of poetry. But I DO have a fondness for this fine example of what it represents. Such a beautiful poem 🙂 You made me smile – thank you. Thanks for stopping by again! Glad you liked it.